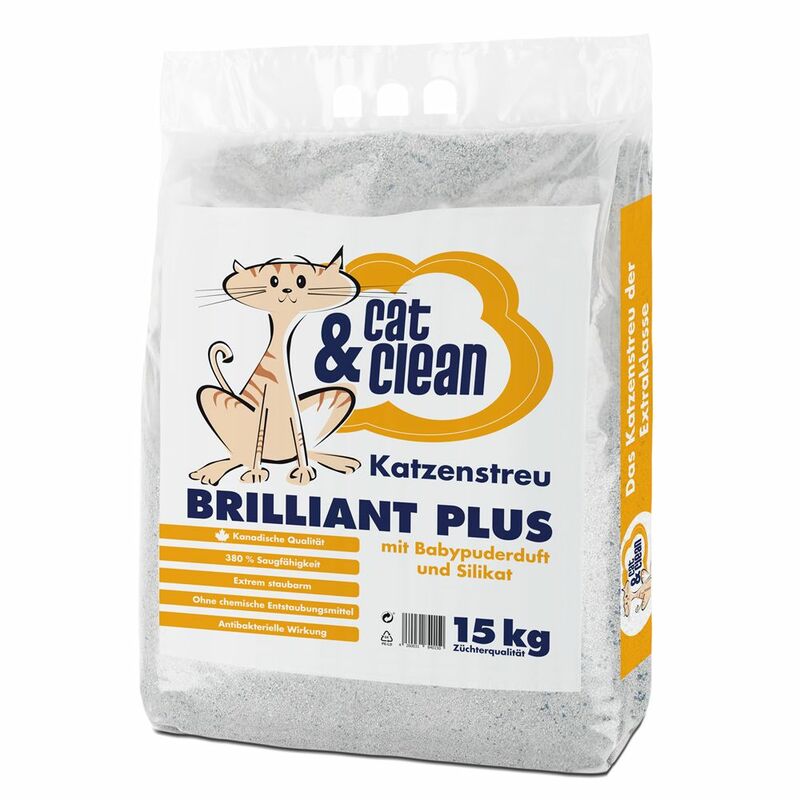 Cat and Clean Brilliant Plus cat litter is a premium, clumping cat litter, made from bentonite clay and designed to meet your cat's desire for cleanlineΒ and freshneΒ. It has a baby powder scent and contains silicate. It is around 3 times more economical in use etna other standard cat litters and has 380% absorbency. This highly absorbent litter rapidly forms into solid, flat clumps when soiled, which are quick and easy to remove so it is not neceΒary to renew the entire contents of the litter tray. This cat litter has a special formula which makes it suitable for multi-cat households. It is very fine and does not stick to your cats' paws, making it ideal even for cats that suffer from allergies. It has antibacterial properties and contains no chemical dust removers. Cat and Clean Brilliant Plus with Silicate and Baby Powder Fragrance cat litter at a glance: 380% absorbency With baby powder fragrance and silicate Clumping litter made from 100% Canadian bentonite clay With anti-dust formula so it is extremely low in dust and ideal for allergy sufferers Suitable for multi cat households thanks to an innovative formula Special anti-odour formula which immediately traps nasty smells Clump forming so very cost effective and easy to clean Does not stick to your cat's paws Very fine granules Approximately 3 times more economical compared to traditional litter Antibacterial effects.